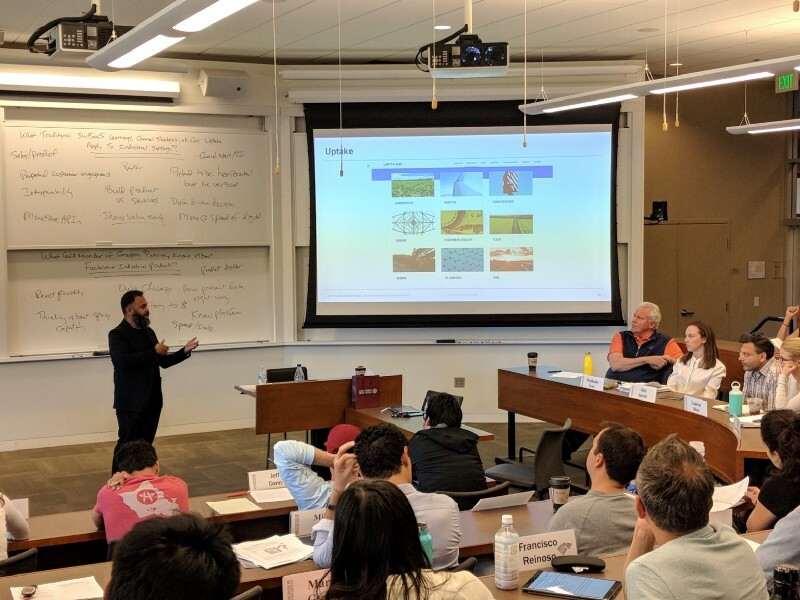 We had one of our most interesting sessions to date with Ganesh Bell, President of Uptake. While we explored how Systems Leaders need to assess those parts of the technical stack where a company needs to own a technology and where a company may need to partner, Bell brought a truly unique point of view — he is a former Chief Digital Officer at GE, he was an executive at several traditional enterprise software companies (SAP and Oracle), and he is now an executive of a company that is working to supply software for the digital industrial transformation. Very few people in the world have his holistic view of how to approach the technical stack in this changing world. In a world where hardware and software are interdependent on each other and require a combination of skillsets and technology from multiple organizations to function correctly, one of the biggest questions that a Systems Leader needs to ask is where his/her company should own a specific technology and where it should partner with others to deliver customer solutions. Historically, industrial companies have attempted to own the entire stack of technologies and therefore lock-in customers to solutions and relationships that would last for years, or in some instances, decades. However, with the rise of mobile computing, the cloud, data analytics, artificial intelligence and other new capabilities, it has become impossible for any single company to provide all parts of a technical stack to customers and deliver the greatest possible customer outcomes. Both a vertical and horizontal technology strategy can have advantages — the former provides deep customer intimacy and the latter offers the ability to have scalability and best-of-class solutions. Bell posited that historically software lock-in was superficial in industrial services; perhaps it provided maintenance information and opportunities, but it did not focus on delivering ways to unlock money from existing assets. With the move to using data that is gathered via a software platform to inform business decisions, suppliers of software services can now focus on delivering better outcomes for their customers. And in order to make this happen, customers require best in class artificial intelligence to train the machines so that better decisions can be made. 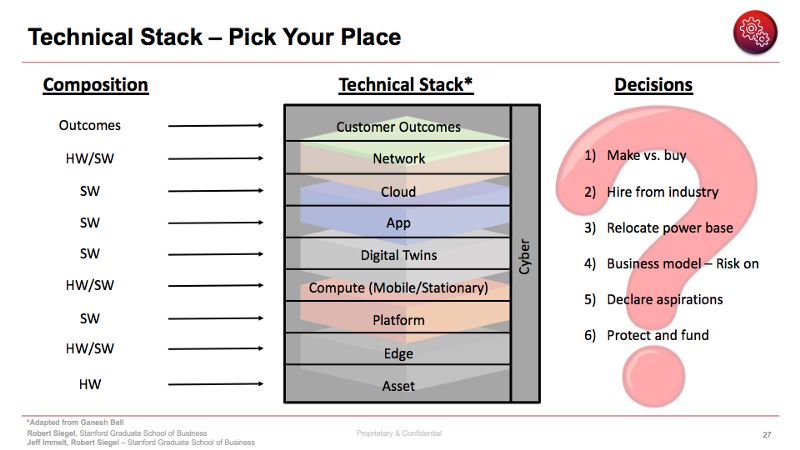 As such, those who deliver the best technical stack will be in a position to deliver the best customer outcomes. In some respects, industrial technical solutions have moved from a vertical orientation to a horizontal orientation, as was described by Andy Grove and Robert Burgelman regarding the computer industry in the 1980s and 1990s. However, even if the technical stack has moved into a horizontal orientation in industrial markets, the go-to-market and purchasing stack has remained vertical in nature. In this respect, the digital industrial market is combining aspects of both a digital mindset and digital orientation with attributes of the historic industrial needs of delivering full product and service solutions that must be installed holistically and completely to meet customer needs. Partner in a Win/Win Manner — Historically, industrial companies have not partnered easily with others as they sought to retain customer relationships as they looked to capture economic value by “owning” the customer. However, in a world where technical cooperation is required to deliver complete customer solutions with the latest technologies in the technical stack, industrial companies cannot have a “winner takes all” mindset. This includes when a company is either working with other firms to deliver a solution or even when an incumbent is making acquisitions and integrating new teams; industrial companies must create cultures that welcome individuals with different backgrounds and groups that use different operating rhythms — which are often markedly different than existing legacy cultures. A critical decision for Systems Leaders is to pick and choose those few areas where they will be best-in-class as part of the technical stack, and also to understand that they must work with others where they do not have a competitive advantage. A company must be great at something in the technical stack, but it will not be able to deliver the greatest possible solution by delivering everything. Embrace Open Platforms — In order to sufficiently put a customer’s needs in the forefront of one’s mind, industrial companies need to offer open platforms which support hardware and software of other companies — even those products against which other divisions of their own organization may compete. Customers in a digital world require open architectures so that they can use best of breed solutions in all parts of a technical and product stack. This market requirement can cause tension inside of industrial firms, when internal software platform providers receive pushback from their hardware counterparts inside of their own companies who do not want their co-workers to support competitive products. Unfortunately, in a world that combines digital and physical solutions that must work with all best of breed solutions, there is no other alternative to meet customers’ needs and drive outcomes that are in the best interest of the customer. Move at the Speed of Digital (Change the Culture) — Industrial firms need to adopt modern methods of product development, including moving from waterfall to agile development methodologies in many parts of the technical stack. Not only is this necessary to meet the increasing demand of speed required by customers, but it is also needed to attract the best new talent who is up to date on modern software development capabilities. Industrial firms must learn not to be constrained by those product development processes that have served them well in the past but cannot deliver solutions for today’s world. This may also require physically locating software centers of excellence away from traditional physical establishments and towards those areas where top talent can be hired in high quantities. Those resources must be adequately funded (paid) and protected against the natural ebb and flow of business. Digital centers of excellence cannot be seen as an experiment; rather, they must be baked completely into the DNA of the company. Build a Belief System: CEOs/CxOs need to believe that they need to own critical control points of apps, data and algorithms in their industry even if they do not know what they are. New Ways to Work: Adopting techniques like design thinking, agile, co-innovation, lean startup and creating a environment for not just new talent but transforming existing talent. New Metrics and Measures: One cannot measure new digital business with old mature business metrics — Systems Leaders need many new proxy metrics that show momentum, traction, adoption, usage and engagement on path to scale — different metrics for each stage of product-market fit, growth and scale. Innovation Through Diversity: While not naturally associated with digital transformation — one way to increase innovation is through bringing in diverse thinking. If one’s workplace is not a fair representation of the societies in which a company operates, the company will live in a world where it is incapable of building products, services and AI that is not accessible by all — and thus the solutions might be just as biased as those who programmed them. Partner in a Win/Win Manner — Some digital companies might be the most egregious entities in acting with a “winner takes all” mindset. Software companies who seek to develop platforms often look to commoditize other parts of the stack and drive down margins for other players in the value chain (e.g. as was done historically by firms such as Microsoft in PC software, and Google and Facebook with digital advertising). This mindset will not be successful in the new digital industrial technical stack, where solutions require all parts of the stack to participate successfully in order to meet customer needs. In addition, when industrial companies are often the channel for delivering software services, and ongoing relationships with end users become the long-term method for maximizing the lifetime value of a customer, digital companies need to find ways to embrace their fellow industrial travelers as these partners will bring the domain knowledge required to deliver successful customer outcomes. Seek the Killer App — Digital companies will not be able to solely focus on the platform upon which others can attach their solutions and expect to build meaningfully sized businesses. In order to architect the best solutions for industrial customers, digital companies will need to incorporate the domain expertise of industrial partners in order to deliver the “killer apps” required by customers. It has often been said that customers do not buy platforms; they purchase solutions. While these solutions might be built on top of platforms, without specific use cases that meet the needs of customers, digital companies will never be able to get the design wins that they desire in the industrial world unless they truly understand the end customers’ desired business outcomes. Finally, Systems Leaders in both companies need to have clarity of vision of knowing “who wants to kill you.” While partnering is a key requirement for success in the digital industrial transformation, Systems Leaders need to be realistic that there are other companies in the market who will seek to occupy one’s position in the value chain. Those other companies are one’s competition, and Systems Leaders need to defend against them when these firms seek to work against one’s interests with customers and partners. Grove, Andrew. “Chapter 3 — The Morphing of the Computer Industry.” Only the Paranoid Survive.